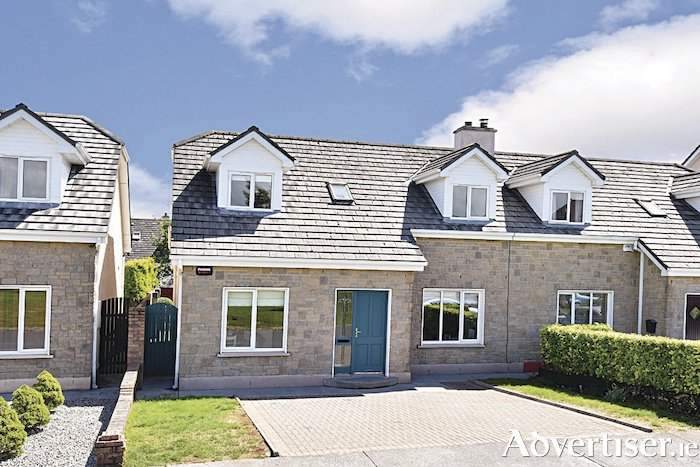 Mullery auctioneers presents to the market this stunning owner occupied semidetached residence extending to approximately 1,470sq feet and ideally positioned overlooking a magnificent green area in Linn Bhui on Bothar Stiofain. Number 7 has been lovingly cared for by the current owners and is tastefully presented with a quality finish evident throughout. Once over the threshold of this fine home, there is an inviting entrance hall with porcelain tiled floor and carpeted staircase leading to the first floor. The living room, situated to the front of the house, boasts generous proportions enhanced by high ceilings and includes an open fireplace and a large window overlooking the green area to the front. On the opposite side of the hall, and again overlooking the green area, is the kitchen/dining room. The beautifully finished kitchen includes a porcelain tiled floor with cream kitchen units and a large central island unit. There are granite work surfaces and a range of integrated appliances. Off the kitchen is a well fitted utility room. Also on the ground floor are two large double bedrooms and a bathroom. Moving upstairs, there are two extremely spacious bedrooms, both of which are en suite. There is also a small office/store room area off the landing. The property benefits from oil fired central heating, alarm, built-in wardrobes to the bedrooms, an open fireplace and excellent tiling throughout. Outside to the rear is a very private garden with lawn, patio, timber garden shed, and a variety of maturing trees and shrubs. To the front is a brick paved driveway bordered by lawns. Linn Bhui is a beautifully maintained development conveniently located close to local services and amenities including shops, schools, public transport, and leisure facilities. Number 7 boasts all the essential ingredients for a superb home including generous proportions, a quality finish, large garden, convenient location, and a magnificent green area to the front which is ideal for young families. Viewing is highly recommended.